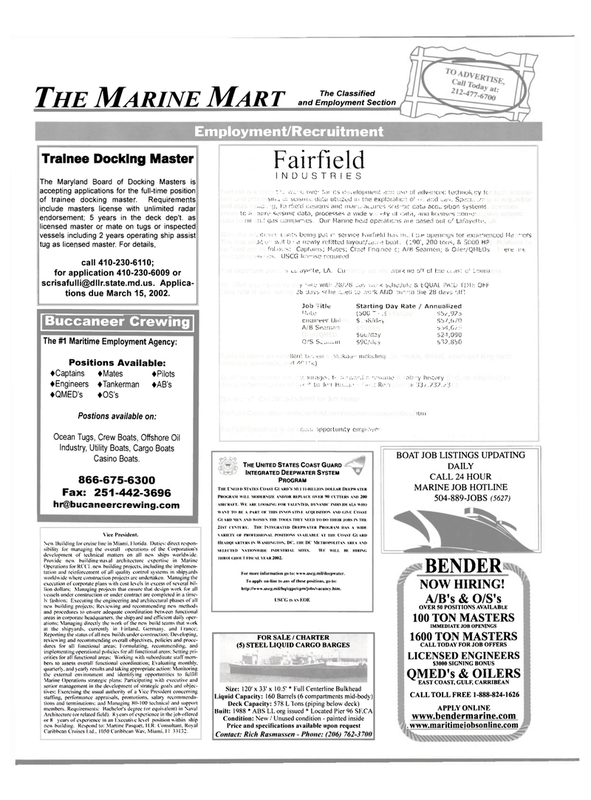 The Maryland Board of Docking Masters is accepting applications for the full-time position of trainee docking master. Requirements include masters license with unlimited radar endorsement; 5 years in the deck dep't. as licensed master or mate on tugs or inspected vessels including 2 years operating ship assist tug as licensed master. For details, call 410-230-6110; for application 410-230-6009 or scrisafulli@dllr.state.md.us. Applica- tions due March 15, 2002. New Building for cruise line in Miami, Florida. Duties: direct respon- sibilit) i'or managing the overall operations of the Corporation's development of technical matters on all new ships worldwide. Caribbean Cruises l.td.. 1050 Caribbean Wav, Miami, I I 33132. THROt GHOL'T FISCAL YEAR 2002. For more information go to: uww.uscg.mil/deepwaler. To apph on-line to .in, or these positions, go to: http://www.useg.mil/hq/tgpe/tpm/jobs/vacane> .him.